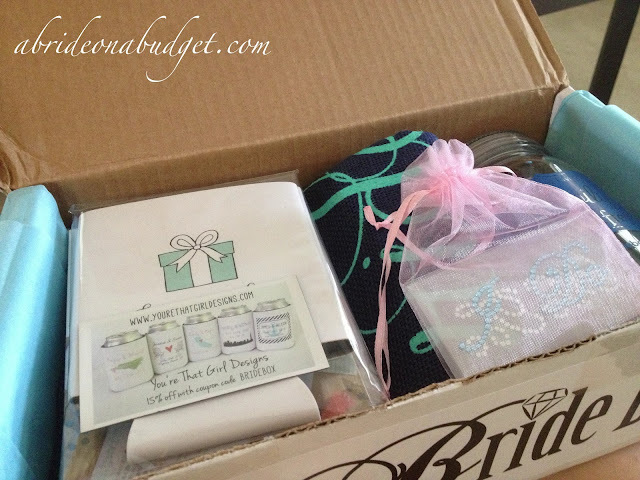 A Bride On A Budget received this box of items for the purpose of the review. It was a little over the week before the wedding and a gift came for me in the mail from The Bride Box. The subscription service, if you haven't heard, is sent to brides monthly as a way to pamper and prepare them for their big day. Since my big day was rapidly approaching, the lovelies at The Bride Box actually curated a personalized box for me to review. The contents of the box came wrapped in blue tissue paper that matched the pop of blue in the logo on the brand's sticker. I've gotta be honest, it was a cute way to stick in "something blue" (even if that wasn't the brand's intention). I opened The Bride Box and inside were nicely stuffed contents. I was really excited to see what was inside. I immediately noticed a coozie and rhinestone I Do shoe stickers. I took those out to see what else was contained inside. 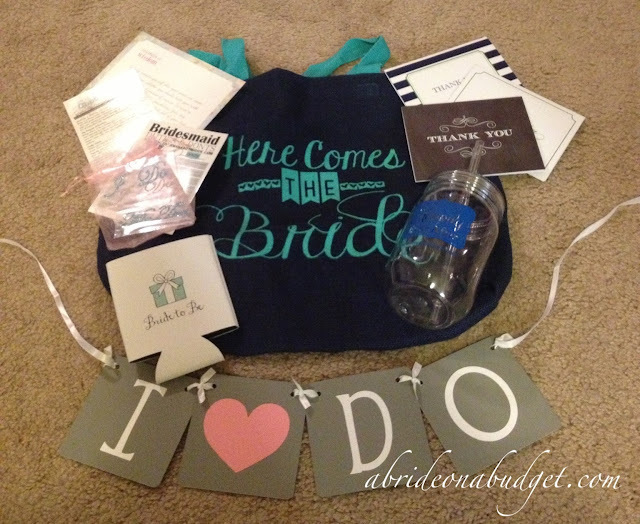 In total, the box had: an I Do banner, a Bride to Be coozie, a trio of thank you cards, a Here Comes the Bride burlap bag, a mason jar travel mug, tip cards to help make your wedding smoother, and the aforementioned shoe stickers. I immediately took the burlap bag and put it in an envelope to mail to my friend. She's getting married in three weeks and her color is blue, plus she's doing burlap everywhere she can. It's like that bag was made for her. Pete took the reusable mason jar mug (which says Happily Ever After) and has been using it all the time. I had intentions of bringing the I Do banner with us to the wedding for staged photos on the beach. And it made it to the wedding but we had to rush our beach photos and take them earlier than expected because there was a storm coming, so the banner got left in the bag. Totally bummed because that would have been a really nice shot. The trio of thank you cards was a nice touch too because when you're wedding planning, you have to thank everyone. We ended up making 19 thank you gifts. That's a lot of cards. Plus, I still need to send one to my seamstress. And then there are the thank you cards you send post-wedding. Yeah, it's a bunch. So it's nice to have this trio on hand, just in case. The items were all really high quality, especially the coozie. It bums me out that it's white because I use coozies when we're out at the beach or the park or at concerts, and it'll get so dirty so quickly. In North Carolina, there is no time when I don't go out without a coozie in my purse, so this is definitely necessary -- I just wish it was black. BRIDAL BABBLE: Which item in The Bride Box is your favorite? I want to save these because I am engaged. My sweetheart and I are having a Southern romantic vintage wedding, and getting married in South Mississippi. Our colors are lavender (using tons of real lavender we ordered from Europe to decorate with), eggplant, and wintergreen. Also - I had never heard of Bride Box!!! I will definitely have to check that out and feel certain I'll be getting a subscription. THANK YOU for posting about it!! I have gotten 2 Bride Boxes so far. ..cute things have been in it! I would love to get this!! I've heard of bride box before, but never really wanted to spend the money on it. (Especially if I got things I couldn't use). I would definitely save these for our upcoming wedding in May though! They are too cute!! I would love to use these for my wedding next year!! I never thought of it before. It so so cute especially for the ceremony. I would give these to my friend who is getting married in September! I've never heard of bride box before but this is adorable! Would love to win!! Definitely would use this next year!! Checking out bride box now - never heard of it before! I will give to my brother & future SIL - they just got engaged last week & are getting married late this fall! would love to give these to them! Keep them! I would love to wear them at my wedding! I will keep them! I am getting hitched. so awesomely cute! 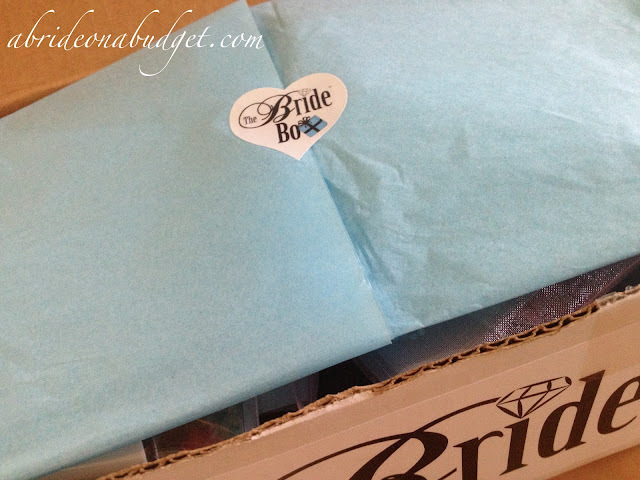 love your bride box! I would give them to my sister who is getting married soon. I will give them to a friend who is getting married. Thanks for the giveaway! Give it to my sister, who is getting married in April! I'd give this to a good friend who's getting married this summer. I'll give them to a friend. I would save this to a friend. I will keep this for myself. Thanks for the giveaway. I would love to keep them!! I would absolutely keep these. They would be so cute for our upcoming wedding. I will give these to my sister. I would keep these for the future. I would keep this. I was recently engaged. Definitely keeping these. My fiance and I are deep in the throes of wedding planning, and I can use every bit of help for our upcoming nuptials. The Thank You cards especially would come in handy because family and friends will be playing an important role in our wedding. I love writing notes of gratitude, especially when folks pitch in with so much love. Also, I don't have anything blue yet, so the stickers would really come in handy! give them to someone else. I would give it to a friend of mine, whom will be getting married soon! Keep them for my Wedding in October! What a sweet surprise! Gotta love that special time in your life. My mom is getting married in September. She would absolutely love this! I will give them to my best friend who just got engaged.